musicians in the concert as a world premiere. Joe Hisaishi was born in Nagano, Japan in 1950. He started to show his interest in minimal music when he was a student at Kunitachi College of Music, and started his career as a modern music composer. Presentation of “MKWAJU” in 1981 and the release of his first album “Information”(1982) was the kickoff of his career as a solo artist. Since his debut, he has released nearly 40 solo albums, including “Minima_Rhythm”series(2009/2015/2017), “Melodyphony”(2010) and “The End of the World”(2016). Starting with “Nausicaä of the Valley of the Wind” (1984), Hisaishi has produced music for 10 Hayao Miyazaki films, including “My Neighbor Totoro”(1988) and “The Wind Rises”(2013). He also composed the music for “HANA-BI”(1998) directed by Takeshi Kitano, “Departures”(2008) directed by Yojiro Takita, “Villain”(2010) directed by Sang-il Lee, “The Tale of Princess Kaguya”(2013) directed by Isao Takahata, “The Little House”(2014) and “What a Wonderful Family!”series(2016/2017/2018) directed by Yoji Yamada. He has collaborated on the music production of nearly 80 films at home and abroad. His works have won many awards including several Outstanding Achievement in Music prizes of Japan Academy Film Prize, “Spirited Away” (won the Outstanding Music in an Animated Feature Production at the 30th Annie Awards), Korean film “Welcome to Dongmakgol” (won the Best Original Film Music Award of the 4th Korean Film Award) and Chinese film “The Postmodern Life of My Aunt” (won the Best Original Film Score of the 27th Hong Kong Film Award). In 2001, he made his debut as a film director with “Quartet”, taking charge of the theme music and co-writing the script. The film was officially invited for the World Competition section of the Montreal World Film Festival. 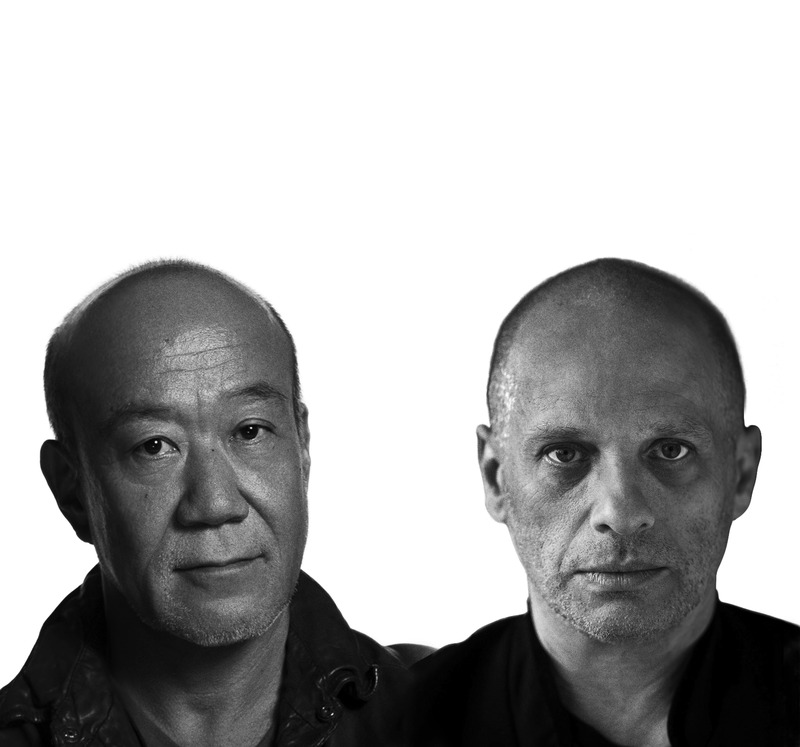 Hisaishi also is well-reputed as a skilled performer, ranging from piano soloist to orchestra conductor. In July 2004, he assumed a post of first music director of New Japan Philharmonic “World Dream Orchestra (W.D.O. 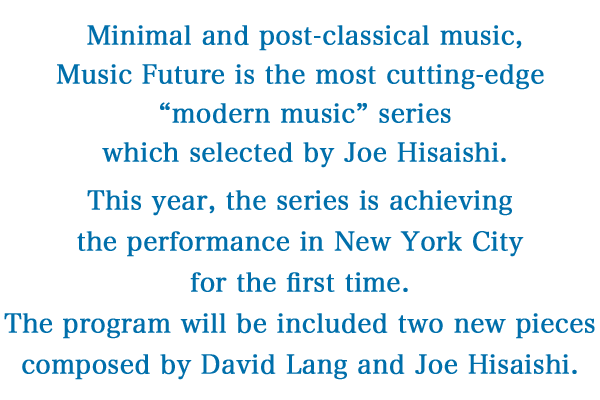 )”, newly formed orchestra project by New Japan Philharmonic. In 2014, he has been working as a producer and conductor, and holding contemporary music concerts called “JOE HISAISHI presents MUSIC FUTURE”, which concert series earned him enormous popularity and records as a live album. In recently years, he works as a classical music conductor and also composed new works in a contemporary music style including “Contrabass Concerto”(2015), “TRI-AD for Large Orchestra”(2016), “The East Land Symphony”(2016) and “Asian Symphony”(2017). 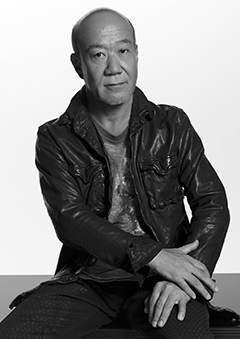 Hisaishi serves as an Invited Professor at Kunitachi College of Music. In 2009, he received the Medal of Honor with Purple Ribbon by the government of Japan. His unique inputs to the concerts as a contemporary musical composer is highly appreciated and his continuous enthusiasm for musical activities that go beyond ordinary creative work is anticipated worldwide. 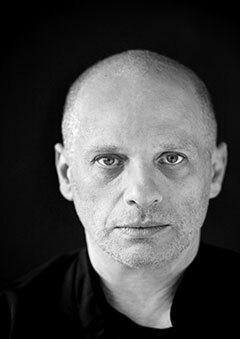 David Lang is one of the most highly esteemed and performed American composers writing today. His works have been performed around the world in most of the great concert halls. Lang’s simple song #3, written as part of his score for Paolo Sorrentino’s acclaimed film Youth, received many honors in 2016, including Academy Award, Golden Globe, and Critics Choice nominations, among others. Lang’s the little match girl passion won the 2008 Pulitzer Prize for Music. Commissioned by Carnegie Hall and based on a fable by Hans Christian Andersen and Lang’s own rewriting of the libretto to Bach’s St. Matthew Passion, the recording of the piece was awarded a 2010 Grammy Award for Best Small Ensemble Performance. Lang has also been the recipient of the Rome Prize, Le Chevalier des Arts et des Lettres, and Musical America’s 2013 Composer of the Year. Lang’s tenure as Carnegie Hall’s 2013–2014 Richard and Barbara Debs Composer’s Chair saw his critically acclaimed festival collected stories showcase different modes of storytelling in music. Recent premieres include his opera the loser, which opened the 2016 Next Wave Festival at the Brooklyn Academy of Music, and for which Lang served as composer, librettist and stage director, the public domain for 1000 singers at Lincoln Center’s Mostly Mozart Festival, his chamber opera anatomy theater at Los Angeles Opera and at the Prototype Festival in New York, and the concerto man made for the ensemble So Percussion and a consortium of orchestras, including the BBC Symphony and the Los Angeles Philharmonic. In addition to his work as a composer, Lang is Artist in Residence at the Institute for Advanced Study in Princeton, New Jersey, and is a Professor of Composition at the Yale School of Music. Lang is co-founder and co-artistic director of New York’s legendary music collective Bang on a Can. His music is published by Red Poppy Music (ASCAP) and is distributed worldwide by G. Schirmer, Inc.